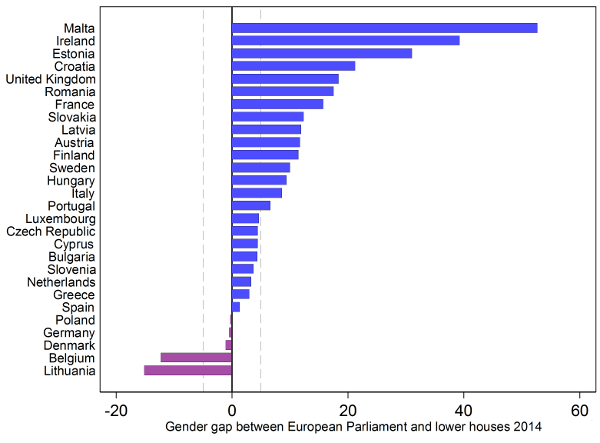 Across Europe there is a wide variation in the percentage of female representatives in national parliaments, with the gender balance typically skewed toward male representatives. But what can the European Parliament tell us about mechanisms for ensuring a better gender balance? Jessica Fortin-Rittberger and Berthold Rittberger write that there is a clear ‘gender gap’ between the European Parliament and national parliaments, with the European Parliament consistently containing a higher percentage of female representatives than national parliaments overall. The exact reasons for this are unclear, however, and may relate to the candidate recruitment procedures employed by political parties. For those who care about gender equality in politics, the European Parliament (EP) is not a bad place to look. The EP has more women in its ranks than the vast majority of the lower houses of the EU’s member countries, making it one of the most gender-equal elected bodies in the world. While still short of full parity, women have consistently achieved a larger seat share in the EP compared to their national parliaments. 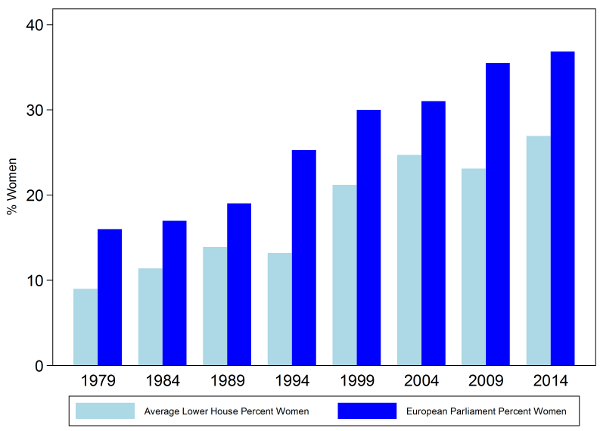 Since the EP was first directly elected in 1979, the share of female MEPs increased from under 20 per cent to 37 per cent in the latest election in 2014, consistently outperforming national parliaments (as shown in Chart 1). Note: For a full explanation of the calculations see the authors’ paper here. Many of those who work on gender representation focus on electoral rules and their impact on the level of women’s representation in parliaments. Other factors that scholars have highlighted refer to the ideological orientation of political parties, the dominant cultural values in societies, socioeconomic factors, the role of women in society, and the timing of women’s enfranchisement. As plausible as these explanations may sound, we find them of limited use to explain the gender gap between the EP and national parliaments. The reason is quite straightforward: The candidates for parliaments at the national and at the EU-level are recruited from the same population and elected from the same electorate. We can hence rule out explanations, which, for instance, highlight socioeconomic and cultural influences in order to explain the gap between the EP and lower houses. These factors are affecting the relevant electorates irrespective of whether they cast a vote in a local, regional, national or European election. As a result, those studying the gender gap between the EP and national lower houses point towards the differences between national and EU elections. For instance, the lesser relevance of EP elections – which is reflected in calling them “second order” contests – makes becoming an MEP a less competitive affair than becoming an MP, therefore favouring women as candidates. Moreover, others have claimed that the use of electoral rules based on the principle of proportional representation (PR) in EP elections has greatly benefitted women. The principal advantage of PR should be to minimise the distortion between the amount of votes a party receives and the amount of seats it obtains. Again, we are not convinced by these arguments. First, female representation is not higher in the EP in every member state. In several EU countries the proportion of women sent to the EP is actually smaller than the proportion of women sent to the domestic legislature. Second, there are also stark differences between countries when it comes to the proportion of female parliamentarians sent to Strasbourg and Brussels (as shown in Chart 2). Note: The chart shows the percentage of female representatives in the European Parliament minus the percentage in the corresponding national parliament (so a positive figure indicates that the percentage in the EP is higher). For a full explanation of the calculations see the authors’ paper here. This lack of systematic explanation encouraged us to take a closer look at the causes of the gender gap. In a recent article in European Union Politics we explored whether the conventional wisdom, according to which electoral rules hold the key to explain differences in patterns of representation, also holds to explain the national-EU gender gap.Even though the electoral rules applied in the member states for EP elections all belong to the family of PR, there are significant differences when it comes to their specifications in different domestic settings (e.g. the formulas translating votes into seats, ballot structures as well as district magnitudes differ sometimes markedly). Two things stand out. First, despite the use of PR we found that EP election outcomes are not more proportional than lower house elections. The higher proportions of women MEPs can therefore not be attributed to the use of the general electoral family of PR.Second, we found that the standard features of electoral systems said to determine its proportionality (such as the electoral formula, district magnitudes, effective thresholds) are not linked to the level of women’s representation in the EP. Moreover, the differences in these features between lower house and EP elections do not explain the gap in representation between these institutions. Our results therefore question the conventional wisdom according to which the choice of electoral rules shapes the composition of the EP. All in all, our findings indicate that neither electoral rules nor any of the factors identified in the literature explain the gender gap. Having ruled out the usual suspects, what then explains the gap? In on-going work, we suggest a shift in the level of analysis by moving from national-level aggregates (such as systems of electoral rules) to the level of political parties and political recruitment processes in particular (as our units of analysis). Why political parties and recruitment? As Pippa Norris and others have argued some time ago, political parties are the crucial gatekeepers when it comes to the selection and nomination of candidates for political office. Interestingly, the size of electoral districts varies remarkably within EU member states in national compared to EP elections (with the exception of Luxembourg and Slovakia). We therefore believe that party organisations come to exercise a very differential impact on recruitment. Unlike in national elections, EP election districts tend not to reflect territorial entities backed by local party organisations; in most countries where the EP elections are run in one nationwide district, rather than in various regional districts, the power of national party organisations tends to be paramount. Differences in districting trigger different dynamics in the process of recruiting and selecting candidates: Depending on who in the party is in charge, intra-party concerns about territorial and ideological balance, or about ‘old’ and ‘new’ personnel on the lists may be addressed differently. We equally assume that differences in candidate selection procedures can have an impact on how gender-balanced lists are. In our present research we therefore explore the consequences of candidate recruitment procedures on women’s representation. We do so comparatively, by looking at different political parties within and across EU countries in the context of EP elections. We also look at the different stages of the recruitment processes to assess which factors or critical junctures in the recruitment process have a lasting effect on list placements. Our preliminary findings suggest that the inclusiveness of the ‘selectorate’ in the early stages of the recruitment processes is one of the central determinants of the representativeness of lists in terms of their gender composition. Hence, when candidates are initially nominated, involving the rank-and-file of the party (and not leaving matters simply in the hands of the party elites), it is likely to lead to more gender-balanced candidate pools. The composition of this initial pool of potential candidates therefore largely channels the makeup of candidate lists in the following stages: If the initial pool is biased in terms of gender composition, the subsequent candidate pools are also likely to remain skewed. Thus far, our findings suggest that broader ‘selectorates’ are most likely to yield gender-balanced pools. Note: This article is based on the authors’ recent journal article in European Union Politics and a paper presented at the 2014 Annual Meeting of APSA. It originally appeared on our sister blog, LSE Europp – European Politics and Policy. The article gives the views of the author, and not the position of Democratic Audit UK or the LSE. PLease read our comments policy before posting. Berthold Rittberger is Professor of International Relations at the University of Munich. How democratic is the UK’s proportional electoral system: the single transferable vote (STV)?